With the holidays right around the corner, it’s time to start thinking about travel—and nothing kills a vacay vibe like lost luggage. The best way to avoid that scenario is to use a carry-on, so we asked our in-house gear experts to round up the season’s hottest pieces. From spinner luggage to backpacks to briefcases and beyond, we’re counting down the top 10 ways to keep your travel essentials close. If you’ve made it this far in life without a truly smart, lightweight carry-on…well, frankly, we’re kind of surprised! So let’s fix that situation quickly. This compact, fully lined spinner suitcase gets bonus points for its durable, scratch-resistant finish and crush-busting corner caps. At just 20 inches, the Kenneth Cole Reaction Out of Bounds Spinner is on the smaller end of the carry-on spinner spectrum—with just enough room for a weekend getaway or a quick business trip. 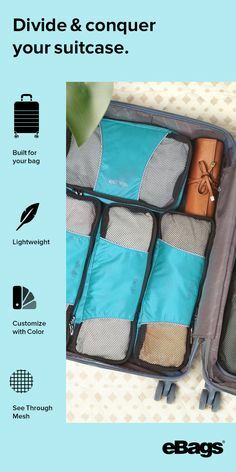 And with nine fresh colors to choose from, it’s the perfect addition to any traveler’s arsenal. Hot tip: the gorgeous new rose gold shade is exclusive to eBags and will likely sell out, so snap it up NOW. Traveling to a city where public transport is king? Whether you’re headed to a business trip in Chicago or on a whirlwind tour of Paris, you need a bag that can handle planes, trains, and automobiles with equal aplomb. The Timbuk2 Command Messenger is that bag—and then some. Seamlessly blending retro design with modern features, this sleek messenger bag has a roomy interior and a TSA-friendly laptop sleeve, so you don’t have to plop your tech in the bin. A top handle helps you convert to briefcase mode, but that handy messenger strap ensures you can be hands-free at any time. Here’s another game-changer in the carry-on space: the underseat tote. Specifically designed to tuck neatly under the seat in front of you, Samsonite Spinner Underseater ensures that your in-flight essentials are within reach throughout your flight—perfect for flyers who want to read a book for a bit…then have a snack…then give the new National album a spin…then fire up a movie on their tablet. So now’s the time to tell him about the Kenneth Cole Reaction Come Bag Soon Messenger. With dedicated pockets for his laptop and tablet and a slim profile crafted from soft Columbian leather, it’s the perfect bag to take his Monday–Friday game up a notch or two. Nothing says “corner office” like an elegant laptop tote, and this is one of our absolute faves this season. The Knomo Mayfair Grosvenor Place Tote makes black not so basic, with the London brand’s signature pair of zippered exterior pockets—one of which is constructed of RFID-blocking material. On the inside, you’ll find dedicated pockets for laptop and tablet, along with a small zippered pocket for keys and other essentials. A bright-red lining makes hunting for specific items a breeze, and a full-length zipper closure means you can tuck the whole thing under your seat without everything tumbling out. 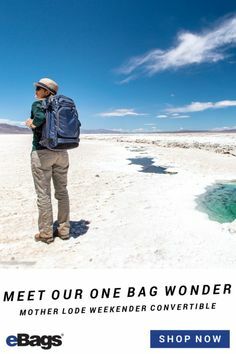 In our nearly two decades of travel gear obsession, we’ve seen a lot of bags come across our desks—and while we’re ALL bag ladies and duffel dudes around here, very few brands have caused more across-the-board excitement at eBags than the launch of Denver’s own Topo Designs. You guys, these bags are Just. Plain. Cool. The Travel Bag Laptop Backpack is already a staff favorite, with its color-contrast styling and 3-in-1 functionality—convertible straps mean you can carry it as a backpack, a messenger or a brief. Pack it like a suitcase and carry it however…it’s one great travel bag. Not all girls are girly girls—in fact, some of our favorite ladyfriends would rather spend five nights in a far-flung hostel than one night in a 5-star hotel. For these game gals, we recommend the Osprey Women’s Fairview Travel Backpack…the perfect wingman for the one-bag traveler. Weighing in at just over 3 lbs., the Fairview offers 40L of cargo space, with ergonomic straps and a supportive waist belt. But what we love most about this bag is the fact that it wears like an outdoor pack, but has the clean lines of an urban bag—right down to the zip-in straps for those Eurail overhead bins. If you travel often, especially for work, you know how important it is to minimize your time in the security lines…and the SwissGear ScanSmart 1900 laptop backpack can help you do just that. This eBags exclusive consistently ranks among our top-selling and highest-rated products—and here’s why. Thanks to the 1900’s unique butterfly construction, you can leave your laptop and other tech items in their designated sleeves—just unzip and lay the bag flat on the TSA belt! There’s even a handy little stash pocket in the front for your 3-1-1s…plus TONS of cargo space and other smart pockets. The road to the top isn’t paved with gold—it’s paved with long hours, red-eye flights and LOTS of nailed first impressions. Get all your business trips off on the right foot with the Victorinox Werks Traveler Carry-On. This hard-working, grown-up case is built to last a lifetime and look good doing it. At 22 inches, it’s at the upward limit of carry-on sizing, so there’s room for everything you need. We especially love the built-in suiter to keep your pants and coats pressed, plus the handy accordion-style front pocket—it’s even got a laptop sleeve if you don’t want to bother with a personal item. Don’t take our word for it—listen to 3,822 reviewers who have given the eBags Professional Slim Laptop Backpack (and its smaller sibling) a five-star rating! So when we say that “literally everyone” needs this bag, we’re totally serious; it’s hands-down the most organized laptop backpack we’ve ever seen. With a spacious main compartment and a theft-discouraging hidden laptop sleeve, the Professional Slim totes all your essentials with ease. There’s a pocket for everything you can think of, including a special “AC garage” to corral all your cords and a next-level organizer area for small stuff. Not so long ago, traveling used to be a thoroughly fashionable affair. 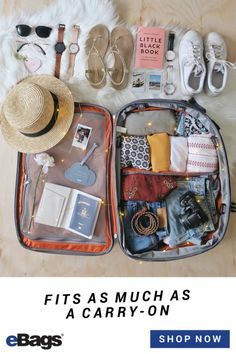 And, whether or not you can personally remember those heady days before sweatpants and salty-sweet snacks, you’ll definitely appreciate a carry-on that’s dressed to go places. A high-gloss exterior, with an interior that’s nicer than the inside of most suits. A carry-on that fits perfectly overhead, while meeting the lofty goals of looking great and traveling tough. That’s our new Fortis Hardside Spinner Carry-On, in a honey-roasted nutshell. With its business-friendly design and vacation-ready color palette, Fortis was indeed inspired by the golden age of travel—when in-flight meal service offered more than a pack of peanuts, and travelers dressed for the experience. 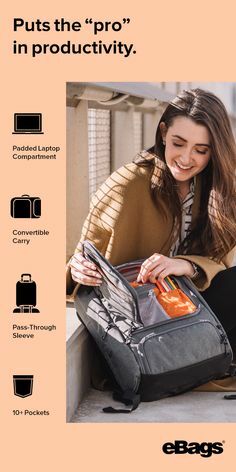 But considering eBags’ dedication to meeting the needs of the modern traveler, it shouldn’t be surprising that Fortis is loaded with get-everything details…at a go-anywhere price. Easy to Lift. Hard to Break. 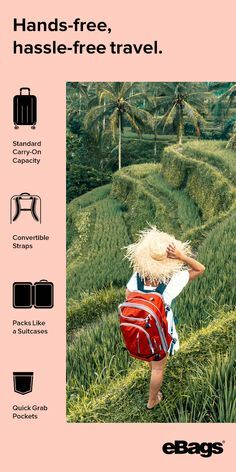 With over 90,000 products on site and more than 17 years in the travel goods biz, we’ve seen more than our share of suitcases—and we’ve personally road-tested literal hundreds of hardsides. The secret to a rock-solid spinner is the shell; you’ve got to strike the perfect balance between lightness and durability. So how do we do it? With 100% Bayer Makrolon Polycarbonate. Feather-light and nearly indestructible, it’s the state of the art for hardside luggage…and ours comes in four artful high-gloss shades. If you’re going to make a bag that turns heads, you’d better make sure it’s ready for any unwanted attention it might attract. 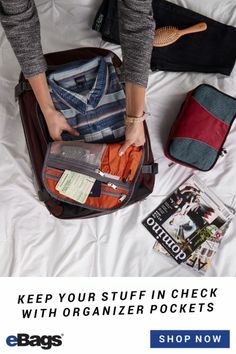 That’s why Fortis is equipped with a TSA-recognized, three-dial locking system to keep your stuff secure—along with a sturdy expansion zipper to ensure that ALL the aforementioned stuff will fit. An innovated raised rib design helps prevent scratches and scuffs, while premium Hinomoto double-wheeled spinners are smooth, silent and recessed for maximum packing capacity. Including Fortis (and Allura, our new smooth-sided spinner) eBags Brand product line is now 75+ strong—with 11 new products launching this month to fill key niches in our overall offering. Value-conscious flyers will be especially excited about the Journey Collection, which includes two fabric spinner carry-ons that are available both as individual pieces and a set. 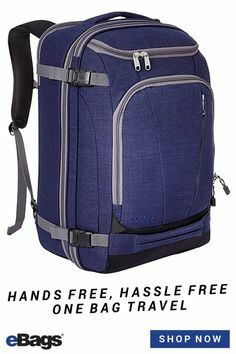 We’ve also added Clip and Stash, two cool new value-priced laptop backpacks that are perfect for the college set and biz world up-and-comers—plus the Portage Toiletry Kit, an essential travel accessory available in three sizes to suit multiple trip lengths and accommodate families. But the real hero of this collection is the game-changing TLS Convertible Wheeled Carry-On: a revolutionary 2-in-1 suitcase/backpack that may just change the way people travel forever. Our newest family members, like eBags cult favorites such as our Ultralight Packing Cubes and the Professional Slim Laptop Backpack, are designed with quality, durability and most importantly—you, our customers—in mind. Maybe that’s why, out of 90,000 travel bags, gadgets, and accessories, eBags Brand products are far and away our best sellers. Be the first to experience Fortis and our other fan faves…shop eBags Brand now. It’s that time of year again—Nanas and Pop-Pops all over the world await their darling grandkids’ arrival with twinkling eyes while traveling moms and dads head for the airport with dread in their hearts. For between us weary parents and our (multiple) glasses of mulled wine, there is a long, strange trip ahead. Yes, somebody WILL have a meltdown…let the travel experts at eBags help ensure it’s not you, with these essential products and kid-friendly travel tips. You know that part in the airline safety schpiel about the oxygen masks…the one that implores you to take care of yourself first? It’s a strategy that applies to your entire trip, not just the portion you spend on the plane. Your kids are not only sensitive to disrupted routines, missed naps and new environments—they’re quick to pick up on your panic, whether your flight has been delayed or you’re experiencing a DEFCON-5 diaper blowout. If you can find a way to make each little blip into an adventure, your kids will be much more likely to roll with the changes, too. MUST-HAVE: If there’s EVER a time to have a really great diaper bag, it’s during your holiday travels. We love a messenger style for airline trips (hello, hands-free happiness) and the unique fold-down front pocket of the Ju-Ju-Be Legacy B.F.F. Convertible Messenger gives you easy access during emergencies. EXPERT TIP: In the event of the aforementioned in-flight diaper blowout, don’t be afraid to ask for help. Calmly press the call button, and ask the flight attendant to bring you two garbage bags—one to contain the mess, one to wrangle any messy clothes you want to keep—and a handful of paper coffee pods. The latter, you’ll distribute to the anyone sitting near enough to be bothered by any unwanted aromas. 2. Tech it Up a Notch. You can be a no-tech, no sugar parent the other 51 weeks of the year—the holidays are all about indulgence, and a few hours of pixel-perfect entertainment for your kiddo will dramatically improve the flight experience of everyone seated in your row. Trust us: nobody will judge you for this decision. MUST-HAVE: Does your tolerance for smeary fingerprints goes WAY up when you become a parent? Yes. Do you still want little Charlie to have his very own tablet? Also yes. Get the Samsung Galaxy Tab E Lite Tablet, which comes pre-loaded with STEM/CORE-aligned content and has a sturdy built-in bumper. EXPERT TIP: Our resident traveling parents have found that on the road, it’s ideal to have a balance of new games/programs and old favorites. Let your child help choose, so he/she knows what to expect. More on the subject of giving your kids a voice in the packing process: most kids take great comfort in simply being heard, so allow yours to be involved in what they’re bringing along. Help them make a list of toys, games and comfort items, then supervise them as they pack them into their very own bag. MUST-HAVE: Give your kids autonomy and lighten your own load by letting them carry their own “personal item” on board—the Wildkin Pack-N-Snack is perfectly sized and carries munchies, too. EXPERT TIP: As tempting as it is to to get a wheeled pack for your little one—we don’t recommend these for smaller travelers, who are both less aware of their personal space AND less coordinated when towing a heavier load. Get a lighter pack they can carry on their own, which will limit what they can bring, too. Even if you’re past the diapers-and-bottles stage, it pays to be prepared for everything—including the unlikely event that your darlings will behave perfectly the entire flight. Pack your own bag well, not only with extra layers for you and your crew but with a good book and a decadent in-flight snack. MUST-HAVE: Travel bags can be a bit like old-school maps—once they’re opened, they’re *never* quite the same. Allow for in-flight disorganization with an expandable tote like the Vera Bradley Grand Traveler; it will give you extra cargo for dropped teddy bears, blankies, airport souvenirs and more. EXPERT TIP: When you move into a dedicated bag for a particular trip, make sure you don’t sacrifice the daily “Mom’s Emergency Kit” items you carry in your day-to-day bag. What goes into mine: lip balm, Motrin (adult and child), two days’ worth of daily medications, a stain stick, kleenex, cough drops, band-aids, wipes, a mini toothbrush/toothpaste and hand sanitizer. I keep mine in eBags Padded Pouches, which come in a set of three different sizes. There isn’t a single item I haven’t used. 5. Sleep with the Angels. First rule of parenting: when THEY sleep, YOU sleep…even on an airplane. So the minute your little ones nod off, you should be right behind ‘em. If you need noise-cancelling headphones to do the trick, it’s a worthy investment; Bose QuietComfort 35 Wireless Headphones are the gold standard, with crystal-clear sound and a comfy over-ear design to block out everything standing between you and your Zs. MUST-HAVE: If you (or your kids) have trouble falling asleep in flight, try setting the mood a bit with the Lug Nap Sac Blanket & Pillow. This essential 2-in-1 travel companion, constructed of the coziest fleece, lets you snuggle up with a blankie AND a pillow. When you’re not using the blanket, it provides the cushioning for the pillow; to use both at the same time, simply blow up the pillow insert. Nighty-night! EXPERT TIP: Still can’t fall asleep? Massage a few drops of lavender essential oil into your pulse points or your temples. This ultra-calming (and universally inoffensive) scent is known to soothe the nervous system, helping to reduce any anxiety that might be preventing you from dropping off; it also helps to stimulate circulation, which is a welcome benefit during long flights. Pick up a bottle at your local health food store before your flight—it’s safe for both you and the kids, and most vials are under an ounce. It may not surprise you to learn that quite a few “serial bag shoppers” work here at eBags. It’s not that we’re fickle about our purchases, exactly—we love all of our bags DEEPLY, for a time. But we’re also the first to know when shiny NEW bags arrive on the scene, so let’s just say our allegiances change frequently, and we don’t often have the opportunity to wear anything out. Sound familiar? Giving Back is *Totally* Our Bag. We also believe that wonderful things can happen when a not-so-new bag gets a brand-new owner. That’s why we’re SO excited to announce our new partnership with Goodwill Industries International this holiday season. Thanks to our Trade In, Trade Up program, you can easily donate any gently used bag (backpacks, business cases, handbags, duffels, suitcases and more) by mail. Shipping is pre-paid, so all you have to do is pack up your Give Back Box—and reap the rewards. 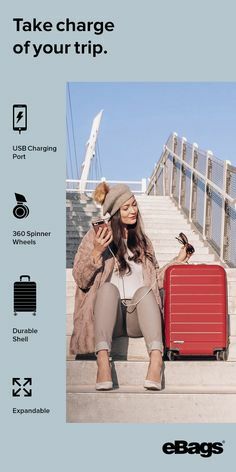 25% off + a FREE Connected Luggage Tag. Think about it: there’s absolutely no downside. With the holidays just around the corner, it’s the perfect time to set aside bags that are no longer getting the love they deserve. You’ll be sharing the love with someone for whom a brand-new bag might be out of financial reach. You’ll also be making room for NEW stuff, which is the perfect way to spend the 25% off coupon we’ll give you—just for making your donation! And when your new shiny eBags arrive, we’ll make it easier than ever to keep track of them with a FREE eBags Connected Luggage Tag. Good for People + the Planet, too. The Trade In, Trade Up Program reduces environmental impact in two ways. First, it gives new life to items that might otherwise end up in a landfill; many mixed-material bags can be difficult to recycle, so they’re often just thrown away. Second, your donations will go directly into YOUR reused shipping box, which is sent directly to Goodwill–and then recycled once it’s empty. And that’s not even including the karma points you’re getting for paying the bag-love forward. 3) Send your box. Mail your donations to Goodwill for free. You can drop off your package at a local UPS store or notify your local United States Postal Service representative of your parcel. 4) Save on something new. Once Goodwill receives your donation you will get an email with a code for 25% off and a free eBags Connected Luggage Tag. THE FINE PRINT: All donations are tax-deductible. Your donations must be gently used, without stains, burns, tears or holes; wheels, handles, and zippers must be intact and in working order.